I have always loved egg noodle kugel. My friends describing passover to me told me that that you can do something similar using shredded potatoes. 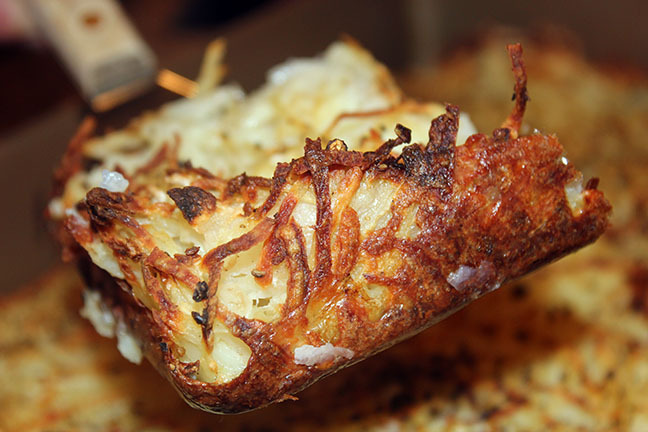 It has the same taste profile as a latke but in a casserole form. It turned out really well! DiDad’s Passion for Pepper is a fabulous hand blended mix of black pepper, granulated onion, granulated garlic, celery seed and sweet bell pepper. This is wonderful on just about anything! A glass of Pinot Noir paired very well with his meal. Wine & Spice Makes Everything Nice! Click here for a printer friendly version of this recipe. Read the Full Recipe Here! I think there is nothing more fun than to travel the world and different cultures by cooking their foods. Today I really wanted to taste a Passover Brisket. I have many Hebrew/Jewish friends and this is a compilation of what they described to me. 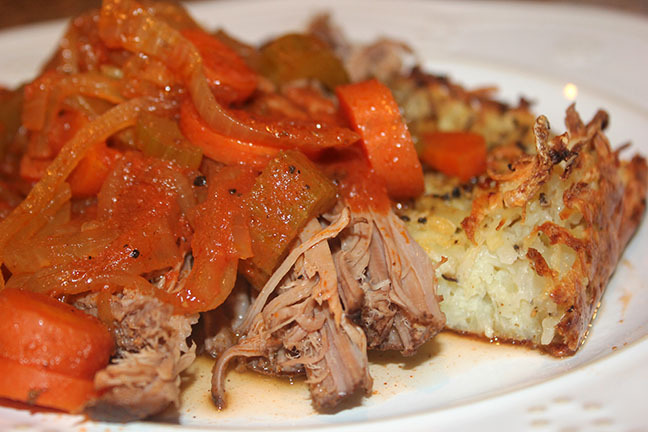 What is there not to love about a yummy beef brisket? Especially when you season it with Mark’s Espresso Rub II. The deep richness of coffee combined with the brown sugar provides an ideal caramelized crust on your steak. Got a little kick! DELICIOUS on beef ribs! Ancho chile powder, ground espresso beans, Spanish paprika, brown sugar, yellow mustard, sea salt, black pepper, Mexican oregano, coriander, ginger root and chile de arbol powder. I served this with a Potato Kugel Casserole. A glass of Merlot paired very well with his meal. Stuffed peppers of any kind is always fabulous! I adore Mexican foods so I thought I would put a southwestern flair on this concept. 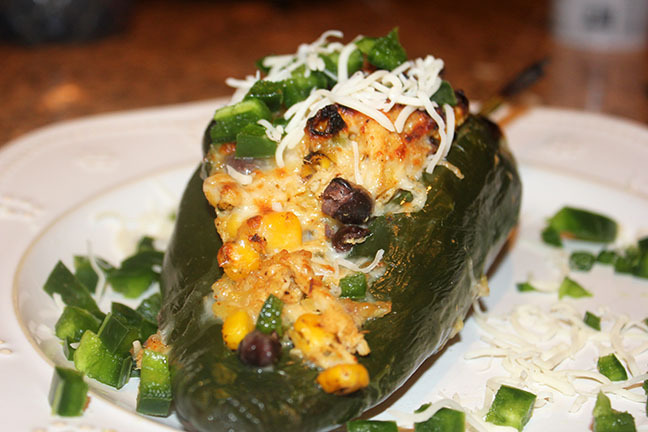 I used Poblano peppers which have a wonderful flavor, not spicy at all and very good! I stuffed them with shredded chicken, black beans, roasted corn, Mexican blend shredded cheese and sour cream. I seasoned this with Taco Tuesday. This mix is hand blended from chili powder, domestic paprika, granulated onion, cumin, granulated garlic, Mexican oregano, brown sugar, black pepper medium, and cayenne pepper. This is a spice blend that should be a pantry staple, one of my favorites! An ice cold Corona beer went very nicely with this meal. Click here to see a printable version of this recipe. This is super easy dinner that will bring everyone to the table for some family time. Very little prep and clean up. Great for the kiddos to help. Play a game before dinner while this fabulous casserole wets the appetite for the whole family. Cream of Mushroom soup is very versatile and is a great item to keep in the pantry for a quick sauce. I used Buon Appetito which is a balanced mix of Greek oregano, basil, marjoram, thyme, rosemary and sage. It really enhances the flavors of tomato sauces, fish, poultry, meat, and salad dressings. Truly a great addition to almost anything. I absolutely love making Sheet Pan dinners! It is so quick and easy—not to mention healthy! 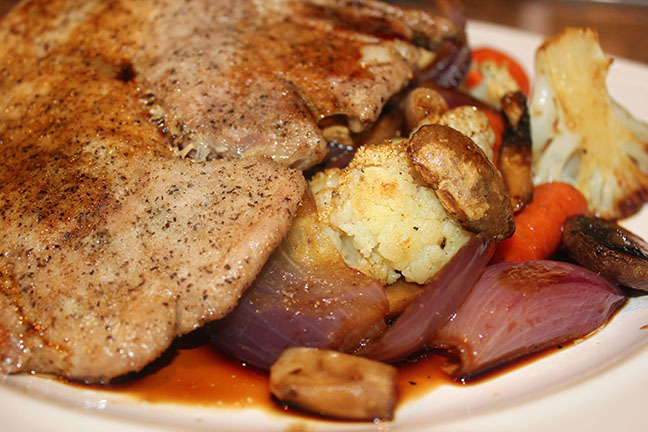 Today I made Pork Chops & Roasted Vegetable with Ravensview Rosemary Garlic. This is such a versatile spice blend, fantastic on veggies, chicken, pork and lamb. It is hand blended with black pepper, sea salt, garlic, onion, chives and rosemary. You can pretty much use any hardy veggies you have on hand. I used cauliflower, carrots, red onion and mushrooms. Some other great veggies are potatoes, sweet potatoes, broccoli, squash, bell pepper, poblano or jalapeño peppers to name a few. You can cook on one or two sheet pans. I wanted a ton of veggies so I used two. A cold glass of Fat Tire Ale is a perfect match with the meal. Click here to see a printer friendly version of this recipe. 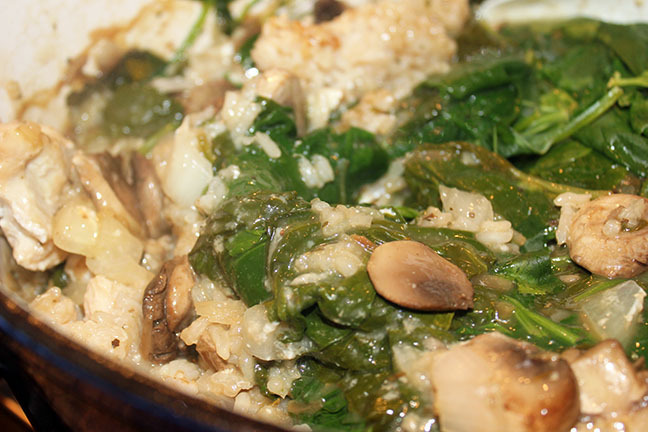 This is another quick and easy recipe to help bring families back around the dinner table. This soup is super simple, and another recipe that the kiddos can help cook. You can pretty much use whatever veggies you have on hand. For this I used carrots, potatoes, onion and celery. You could also use sweet potatoes, broccoli, zucchini, squash, rutabaga, to name a few. Today I used Adobo Lime to season the soup. This fabulous seasoning is hand blended from fennel seed, cumin, coriander, black pepper, garlic, Mexican oregano, lime zest, kosher salt, thyme and rosemary. It is truly wonderful on just about everything from fish, shrimp, chicken, pork, beef and vegetables. One of Milford Spice Company's best sellers at Farmer’s Markets and a customer favorite! You can use a boxed stock/broth or you can simmer you chicken in water to cook and use that as y our stock. 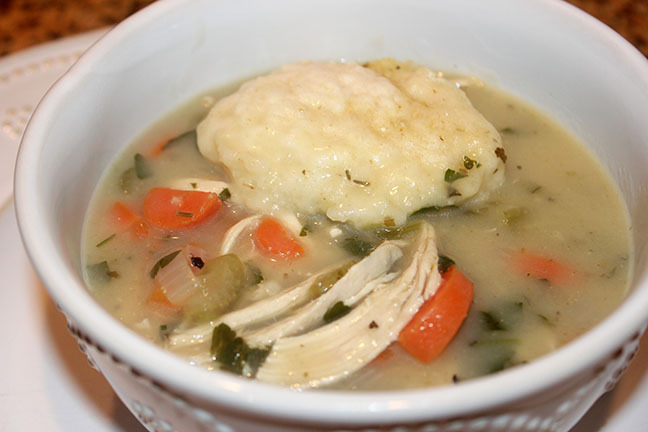 Bisquick is used to create these fantastic dumplings. This soup is perfect for a chilly night….